I heard from several of you after last week's challenge that you donate school and/or art supplies regularly. Kudos! I went through our school supply cabinet and found that even after last year's massive purge, I still had more than we'll need of pens, pencils, erasers, so I culled our stock a bit more. Then I went to Staples and bought spiral notebooks, glue, pencils, and index cards. I took two large bags of donations to Pennridge Fish (our local food bank) and dropped them off. Felt pretty good too! This week I'd like to honor Robin Williams with a challenge centered around a quote from him. I've seen a lot of movies starring Robin Williams - Mrs. Doubtfire, Jumanji, Dead Poets Society, Good Will Hunting, Good Morning Vietnam, License to Wed. There are just as many I haven't seen. But I want to. But I know that his movies always touched me. He made me laugh. He made my world a better place by being here. He will be missed. 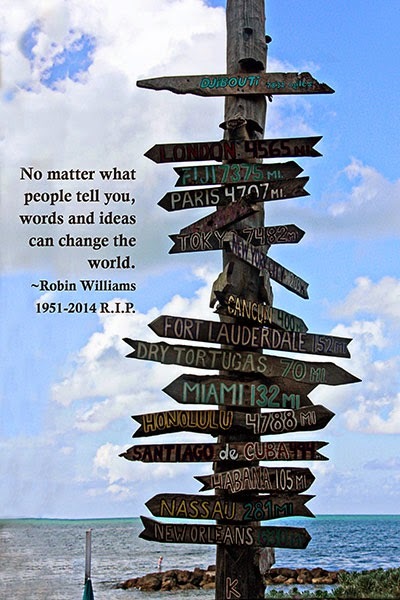 Robin was quoted as saying: "No matter what people tell you, words and ideas can change the world." I would like to believe that my little Kindness project is changing the world, or at least little bits of it, in some small way. Your challenge this week is to USE YOUR WORDS to make the world a little better. How you do that is up to you. 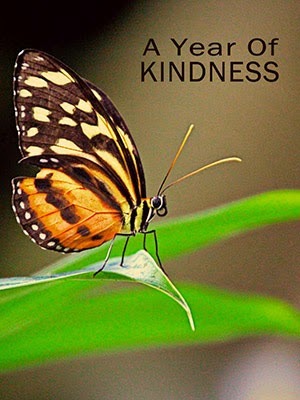 Write an uplifting blog post. Write a letter to someone you love, letting them know how much they mean to you. Smile and say "hello" to everyone you come in contact with. Whatever it is, this week make a difference with your words. Another great challenge this week! I'm so impressed with how you've come up with these week after week! I'm a firm believer of the power of the word. You're right. Words have such power and I do believe that your challenge is making the world a better place - all such actions of kindness do. Thanks for coming up with them! I like your idea! And it fits perfectly with my "list" that is full with names of people I want to write to. I used to be an avid letter writer, starting to have pen pals all over the world when I was 13 or so. Some of them I'm still keeping in touch with, some of them I have met in person. It is lovely and very interesting to connect with people from other countries and cultures this way. I also believe that words are powerful. I have a young lady staying with me, she is like the daughter I never had and I am happy to say that I tell her on a daily basis how much I love her and how happy she makes me. I may not writ a blog post or make a layout but I will now think about writing down some of what I feel. Thanks Cheri. On Wednesday I had the owner of the hair salon I use tell me thank you and give me a huge hug, because I defended the salon on a group on facebook that was trashing them without knowing the whole story. An unhappy customer who waited a month to let them know, and then stormed the salon and created a huge scene. Then on Friday we were given a huge discount on surgery for our cat, unfortunately the second she had to have for the same issue. But it was because "you are one of the nicest clients we have, and the best cat Mommie we've ever seen". I try to always be nice and kind in my every day dealings, and its so nice to know that I've succeeded at least a little bit. I agree another good challenge. Coming Soon - Life Tunes 3!